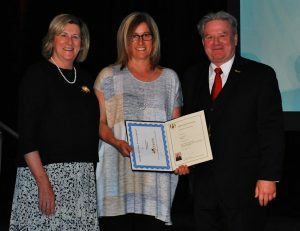 The winner of the 2016 Gerry Sutton Scholarship has worked in the developmental services field for 25 years. She started her career working with children and families, and has progressed through many different roles at her organization, to her current role of Program Manager and Education Co-ordinator. She is relatively new to a formal leadership role and continually seeks opportunities to enhance her leadership skills. Her agency actively promotes and educates employees to assist them on their career paths, with succession planning as a main focus. Throughout her life she has continued to seek opportunities to grow and develop, and is currently enrolled in an undergraduate program through Wilfred Laurier University. She is also progressing through a leadership certificate course sponsored by Waterloo University. She personally believes in education and training, both in practice and theory, and actively seeks opportunities to acquire tools and resources that are transferable to the work she does on a daily basis. She has a son with Down Syndrome, and through her personal experiences, is able to see past many of the barriers that families and staff face on a daily basis. She is an active volunteer in her community with Special Olympics, the United Way, a local soup kitchen and numerous other events and activities.